profession with his boundless curiosity. His quest is the perfect gastronomic restaurant in the Palace of Versailles, creating a modern vision of what the kings would have devised three centuries ago. 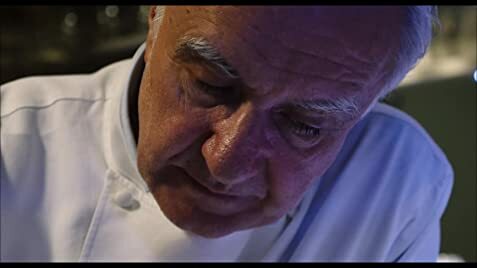 The film follows Ducasse on a journey of 2 years as the audience follows him around the world visiting his restaurants in Tokyo, the United States, Athens, China, the Philippines and elsewhere. In the shadow is the opening of a new restaurant in Versailles with a menu ‘fit for kings’. Despite the chef’s success, fame and wealth, Ducasse remains a humble man. When asked about the ambition of being the ‘King of Gastronomy’ he replies that all he wants is to satisfy and leave memories of a good meal. His idea of a good time is simple – to be alone in a garden with a vegetable. To him being with a carrot or a courgette is to observe nature’s perfection. He is an advocate for sustainable foods, with as little meat or sugar or dairy cream in his desserts. He believes in change, working with a team to share and to come back to the same place. Ducasse is shown as a wise man, not only excelling in gastronomy but in words and actions. The film never shows him angry and hardly dissatisfied. Ducasse is always journeying to observe, his aim to taste something he has never tasted before. The doc is largely narrated by the director himself, who gives a good perspective on what is going on, on the screen. There are lots to enjoy in this eye-opening documentary. The one and foremost is the large assortment of foods on display. Besides looking delicious, the food looks decorative and imaginative. There are also lots to learn bout Ducasse the man and those inspired by him. My personal best food scene is the sturgeon caviar segment. It is explained that the best caviar in the world is from China waters, with cultivation techniques imported from Iran. The audience gets to witness a 10-year old bred sturgeon sliced open for its roe and how the caviar is eventually cooked in a oracular cylinder and brought to the dining table, in all its perfection. Another superb segment has Ducasse having a meal with past-President Hollande as they plan the meal for the Climate Change Summit in Paris. Hollande has his say in the film too. The film contains a few contradictions. Besides stressing Ducasse’s humility, there is a scene where he proudly walks across a garden in the Philippines with the locals carrying an umbrella for him to protect him from getting wet. For sustainable food,s the harvesting of roe and destroying the sturgeon after looks like excessive decadence. The Quest of the film’s title is the Master chef’s is the opening of his new restaurant. This is where the film leads. 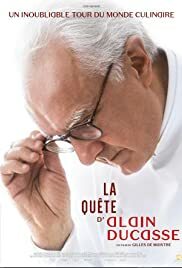 It is clearly not a biography of Ducasse. Nothing is shown or revealed of his family or background except that he has a wife and 4 daughters, one of whom is shown on the screen as the father visits her on a farm she is in charged of. The film culminates with the opening of the Versailles restaurant.